Aegilops cylindrica is a winter annual C3 grass (Waller Lewis 1979), 30-70 cm tall. Leaves alternate, 0.1-0.5 cm wide. Flower spikelets held flat against axis fitting into hollows on each side; glumes keeled on back, hard, 0.7-1 cm long, asymmetrical, with 2 awns, one long, one short (or reduced to a tooth), lemmas 0.8-1 cm long, those of upper spikelets with an rough awn to 10 cm long, awns of lower spikelets progressively shorter; inflorescence an unbranched, cylindrical spike 7-18 cm long 0.5 cm wide, eventually breaking at nodes; blooming and fruiting Spring. Origin: Southern Europe, w. Asia. 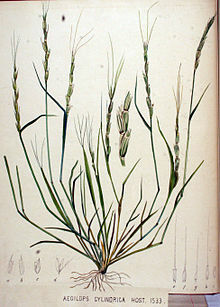 Notes: Hybridizes with wheat (Triticum aestivum), to which it is closely related (Tribe: Triticeae or Hordeae), (Clark and Pohl 1977; Hitchcock 1950). It is apparently a major pest in wheatfields (NAPPO 2005).